MARBLE FALLS — For Jason Ehrig, the Marble Falls Triathlon fits the bill as one of the top events of its kind for both competitors and spectators, and he’s not saying that just because it’s his “hometown” triathlon. Since being bitten by the triathlon bug almost two decades ago, Ehrig has traveled to events across Texas to swim, bike, and run. Though each one offers a unique experience and challenge, the Marble Falls Triathlon has a lot going for it. The Marble Falls Triathlon returns for its 18th year Sunday, July 15, starting with a swim in Lake Marble Falls at Lakeside Park, 307 Buena Vista Drive. The transition area opens at 5:30 a.m. for participants so they can get their bikes and gear prepped. The first of several waves start at 7 a.m. The event, which combines swimming, biking, and running, draws 300-400 competitors a year, though it peaked a couple of times with more than 500 participants. For race director Mario Gonzales, the Marble Falls Triathlon is where he believes it needs to be as far as the number of participants. Gonzales remembers driving into Marble Falls and cresting the hill on U.S. 281 just south of town, which revealed Lake Marble Falls below. He thought this would be a great place to hold a triathlon. Several years after that epiphany, he and then-co-director Roger Solers crafted a course that took advantage of Lake Marble Falls and the surrounding roads and hills. 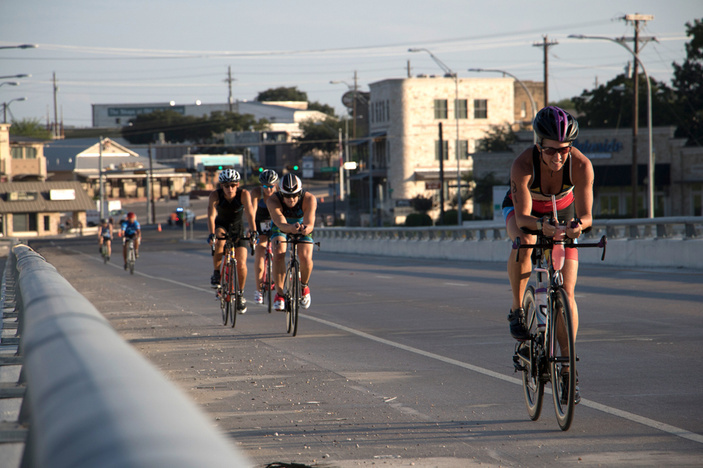 Once they got it up and running (and swimming and biking), the Marble Falls Triathlon blossomed into one of the most anticipated events of its kind, drawing repeat competitors and new faces every year. The Marble Falls Triathlon consists of two distances. The original intermediate competition starts with a 1-kilometer swim in Lake Marble Falls followed by a 23-mile, out-and-back bike ride south of town on 281 to Texas 71 west, and capped off with a 4.4-mile run from Lakeside Park through the Pecan Valley area of Marble Falls. Gonzales was content with this course, but a number of people asked for a shorter, sprint distance, and he added it several years ago. The sprint distance starts with a 500-meter swim followed by a 12-mile bike ride and finishing with a 2.2-mile run. While the event draws first-timers each year, Gonzales doesn’t encourage newbies to sign up for the Marble Falls Triathlon, even the sprint, as their first one. The course is quite challenging, especially the bike ride, which includes several hills on 71 west of 281. While it is doable for a first-timer, it’s better to have a couple of races under your belt before tackling it. Over the years, the Marble Falls Triathlon has attracted some of the elite in the sport, including Desiree Flicker, who is an internationally known triathlete. Even Ehrig, who has competed in the Marble Falls event several times, said the course’s challenges can sneak up on you if you’re not prepared. Gonzales had two reasons for founding the event. At the time, he and his wife, Amy, owned a small sporting goods store, RPM Sports, in Marble Falls, which carried running, swimming, and biking gear. A triathlon would promote the business, which has since closed. The second reason, and one that remains important to Gonzales, is to encourage people to become more active, whether by going for a walk or a run or something more strenuous, like a triathlon. Though it hasn’t attracted as much local attention as he had hoped, over the years, Gonzales has watched as people who didn’t think of themselves as athletes, or who were overweight or out of shape, begin their journey to a healthier lifestyle by way of the triathlon. “We’ve had volunteers come out who knew nothing about triathlons, but after a year or two of volunteering, they get inspired and know they’re in it,” he said. Ehrig pointed out that a misconception of triathletes is they’re amazingly fit people with “ripped” bodies. Age isn’t an issue either. Competitors are in their teens through their 80s and older. “When I get a person a decade or more older than me who flies by me on the bike, that’s really exciting to me,” Ehrig said. Some of the most competitive triathletes are in their late 30s and 40s, Gonzales said, because they’ve spent the years building up endurance and acquiring race savvy. Even if Highland Lakes residents don’t compete, Gonzales hopes they’ll stop by the course on Sunday morning. Despite this being the 18th year of the Marble Falls Triathlon, there are a lot of locals who aren’t aware it exists. Part of that is due to the efficiency of the event. With the race starting at 7 a.m., most of the competitors are done by noon. And the course is laid out in a manner — with input and support from law enforcement — to reduce the impact on vehicle traffic. By the time many people are up and about on Sunday, the race is done. A good spot to check out the event is Lakeside Park, where the hill coming off Lake Marble Falls acts as natural stadium-style seating. “You can see the entire swim and watch them come out (of the water) and transition to the bikes,” Gonzales said. There’s no admission for spectators. As for competitors, online registration at marblefallstri.com wraps up Wednesday, July 11, but people can still register in person at one of two packet pickup locations. On Friday, July 13, packet pickup is noon-7 p.m. at Austin Tri-Cyclist, 923 Barton Springs Road in Austin. On Saturday, July 14, pickup is noon-5 p.m. at Holiday Inn Express and Suites Marble Falls, 714 Corazon Drive. There is no packet pickup or registration on race day. Who knows? You might find inspiration to dust off the old Schwinn and go for a spin. For other local competitive events, check out the Highland Lakes Races guide.